Advocacy documentaries are on the rise. This year saw the release of Captialism, Food, Inc.and The Cove, just to mention a few. How much you’ll enjoy these movies ends up depending on how sympathetic you already are to the message, although the better the documentary, the less that matters. The Cove stacks up relatively well by maintaining it focus (unlike Food, Inc.), but loses steam with a collapsing story arc (unlike Pirate for the Sea). The title refers to a tiny little fold in a Japanese coastline near a town called Taiji. For half of any given year, passing dolphins are herded toward the shoreline where representatives from Sea World-type entertainment venues gather to select their favorite dolphins — young ones that can easily be tamed and trained. Anybody can watch from the highway or on the rocky path between the road and the shore. The Cove is part of Ric’s efforts to expose the practice and shut it down. Ric worked on the TV show Flipper for many years and in fact caught 5 wild dolphins and trained them for the show. But he gave it up when he realized how intelligent and social dolphins are. He recounts the story of a captive dolphin “committing suicide” in his arms. Whether or not you accept Ric’s interpretation of the dolphin’s death, it changed his outlook, and he has spent the rest of his life fighting dolphin captivity. Watching Ric and his A-team of hi-tech commandoes makes for some good, tense entertainment. They make a nighttime raid across razor wire and rocky terrain to plant hidden cameras and microphones, hoping to capture the slaughter on video for the documentary. But one thought keeps coming back, every time we see Ric and his team confronted by locals. They stand out like a sore thumb. They are tall, white, and European-looking among the homogenously Japanese locals. They are foreigners in a culture that doesn’t welcome them. They come not for commerce or tourism, but to moralize against the local way of life. There aren’t any local activists sympathetic to Ric’s cause. In fact, the locals are so well organized that they make it very difficult for the Westerners to even see the cove. 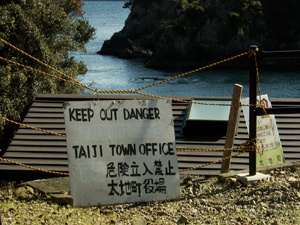 It’s pretty obvious that no amount of outside pressure is going to spur a change of heart among the residents of Taiji. Until there are local activists willing to shame their neighbors into doing the right thing, no amount of exposure from The Cove is going to effect a real change. Unfortunatley, that makes The Cove less satisfying that it should be. The best The Cove can do is to make the culturally-independent moral case against the slaughter of dolphins and hope that someone in Taiji will take up the call. If that’s the best the movie can do, then The Cove feels like an exercise in futility. It’s noble, and it’s a step in the right direction, but it’s frustratingly indirect for any westerner moved by its message. Here’s hoping The Cove ’s Oscar nomination gives it more exposure. Maybe in the long run it will not be so futile after all.